Take a sheet of white paper and draw an American flag shape. I made mine 9 3/4" wide x 6 3/4" high with the lines approximately 1" wide. The box for stars is 4 ¼" wide x 3 ½" deep. I ran this off on the copy machine on white card stock for each child. You can then have them 1) glue it onto red or blue construction paper, 2) add magnet to back or 3) or glue yam to back and hang up in the bedroom or on doorknob. Optional: We also used this same craft for pre-K/K kids. 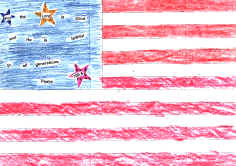 They put stars at random in blue box, glued memory verse on bottom fight side of flag instead of cutting into individual words and learned only the first phrase of the verse.